Laos proved a little more laid back than John could handle, so we cut short our visit by two days and headed to Phnom Penh. This is where we spent a very bizarre last day of 2011. It has been 10 years since I was last in Cambodia and the memory of its horrible history had faded. 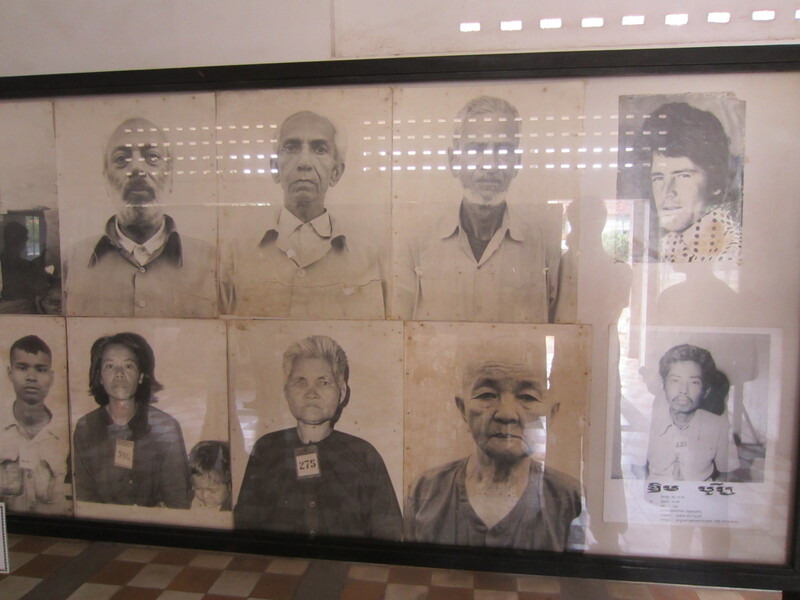 On Saturday morning we gathered our strength and hired a tuk tuk to take us to the Tuol Sleng Genocide Museum, known as S-21 during the Khmer Rouge era. The four buildings had been a primary and high school before 1975. 20,000 people are thought to have died here died here between 1975 and 1979, but only 14,000 deaths are meticulously recorded because they did not count the children who were killed. It is a disturbing monument to man’s appalling cruelty towards other men. This is not a slick museum experience. It was one of the most horrific prisons in history. Whole families were brought here to be tortured then killed. There has been no budget for fancy displays. It has been left very much as it was found on January 7, 1979, when the Khmer Rouge were driven from Phnom Penh by the Vietnamese. You see the iron bed frames that 14 decomposing corpses were found shackled to when the prison was exposed. Photographs of the barely recognizable bodies are hung on the walls above. Many classrooms had been divided into dozens of cells, 2 feet wide by 6 feet long. 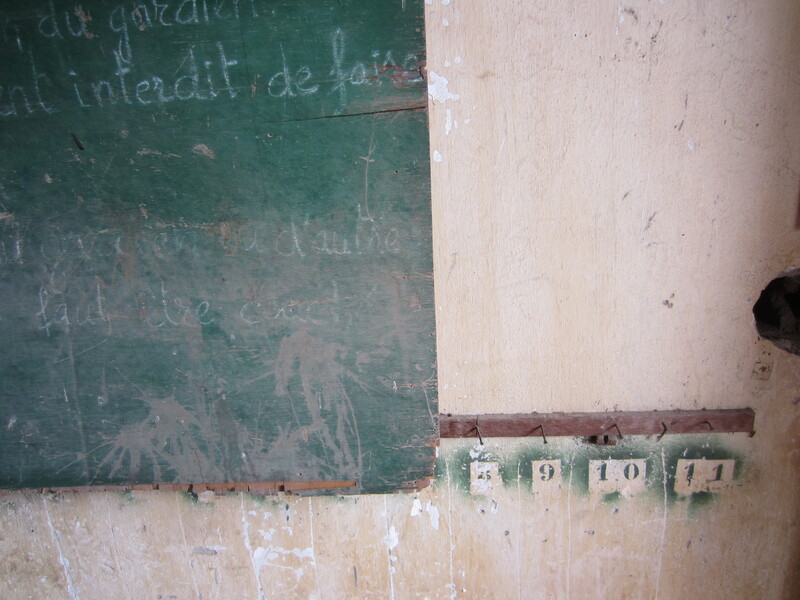 Some still had blackboards and hooks where kids had once hung their jackets. Room after room is filled with souvenirs of man at his most inhumane: photos of the prisoners, torture instruments, piles of skulls, drawings and stories by survivors. There were also stories told by people who had worked at the prison, many of who were the same ages then that my kids are now. We learned it is much easier to coerce children. We left sober and stunned. And hopefully a bit wiser. The goal of the museum is to prevent a new Pol Pot and his regime from emerging in the lands of Angkor or anywhere else on earth. I desperately hope they succeed. A few hours later were celebrating New Year’s Eve at Raffles Hotel Le Royal, a charming old world hotel built in 1929. 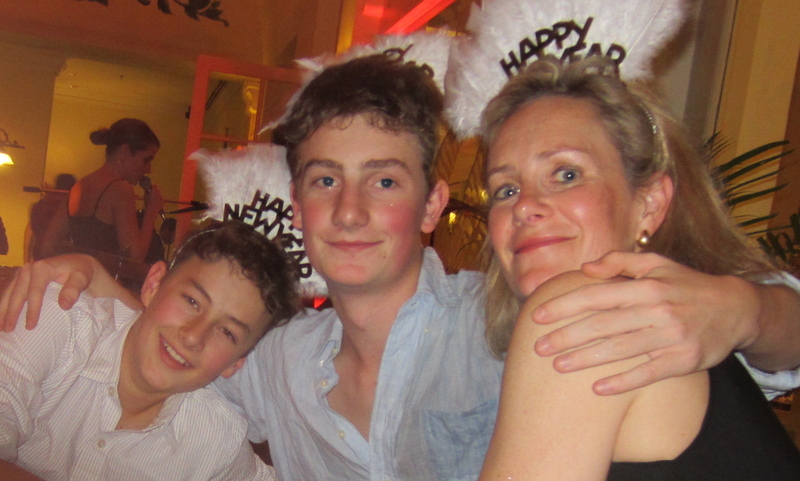 We joined a family from New York who we had met in Laos for a fabulous 6-course dinner. They have two girls who hit it off with our boys. The father had grown up in New Jersey only a few minutes from where I grew up. Our table was on fire… great conversation, great wine, great party favours, tons of laughter! At 11:45 we rushed to the lobby of this Grande Dame of a hotel to welcome in 2012 with a hundred other guests all dressed to the nines, lots of champagne, balloons falling from the atrium and nose makers in everyone’s hands. It was incredibly decadent. And a slightly disturbing contrast from our morning. I have always referred to New Year’s Eve as amateur night, preferring to spend it with a small group of friends. However, this was an awful lot of fun! We danced until 2:00 am and collapsed into bed having had a wonderfully entertaining evening and full of hope for 2012. Fingers crossed it will be a great year full of adventures for all! Happy New Year!